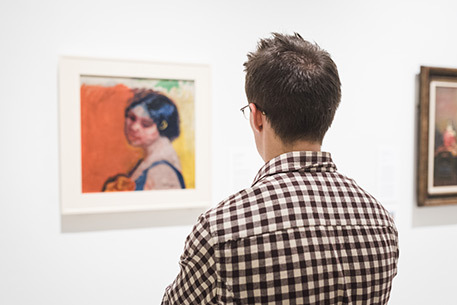 During your visit, help the Smart protect the artworks in our galleries by following a few simple guidelines. Please do not touch the art. To avoid accidents, be aware of your surroundings and keep a safe distance from works of art, cases, and platforms at all times. Before entering the galleries, check large bags, backpacks, and umbrellas at the information desk. The bag check is complimentary. Please dispose of any food, drink, or gum. Write and sketch only with pencils. If needed, pencils are available at the information desk. If you plan to take photos in the galleries, read over our photography policy. Bag and coat check services are complimentary. A coat closet is available for use by our patrons, and is located just around the corner from the Museum entrance. Large bags, backpacks, umbrellas, and other items should be checked at the information desk. The Smart Museum is not responsible for lost or stolen property. Visitors may use strollers throughout the Smart. A ramp into the Museum’s galleries is located just past the café. Strollers may also be stored in the coat closet or at the information desk. Photos must be taken using existing lighting only—flash photography and the use of external lighting equipment is prohibited. Photos may be taken with a hand-held camera or cell phone. Use of professional video cameras, tripods, or other equipment is not allowed. In some cases, works on loan from other institutions or individuals may not be photographed. Such works will be clearly marked with a "no photography" icon on the label or near the work. For clarification on what is what, please consult with our information desk on the day of your visit. Use only graphite pencil or graphite stick in the galleries. No crayon, charcoal, Conté crayon, ink, or chalk is allowed in the gallery spaces. Any dry media however is acceptable for use in the Museum’s lobby. No spray fix is allowed in the Museum building. No wet media (e.g. paints) are allowed in the galleries. Use only a handheld notebook or sketchpad (no larger than 14 x 17 inches). Clipboards may be borrowed from the education department by making arrangements in advance. Do use gallery stools—they are located in the reception hall near the drinking fountain and coat closet. Do not use any wall surface, pedestal, or platform to prop up work. Do not block passageways in galleries.